PDQ PowerBook G3 at 8: Still Useful or Too Long in Tooth? Another week; another PowerBook anniversary. Last week we commemorated the PowerBook 5300's 11th, and Friday, Sept. 1 marked eight years since the second-generation PowerBook G3 Series was released. To recap, the first generation G3 Series 'Books were the MainStreet/WallStreet models introduced at the World Wide Developer's Conference in May 1998. They were a radical departure from previous PowerBooks, with their swoopy, contoured styling, big screens, wonderful scissors-action keyboards, and expansive palm rests. And they didn't automatically ship with a floppy drive. The June 1998 Macworld magazine's cover story, "Desktop Invaders", was a 12-page spread on the new machines in which Henry Bortman allowed that the PowerBook G3 would threaten the relevance of desktop Macs. While the desktop is still very much with us in 2006, Apple 'Books have been outselling their desktop cousins for several years now, so Henry was on track. I was already onside. Never say never, but I can't currently imagine ever buying another desktop Mac, except for perhaps a near-portable like the Mac mini. A 233 MHz G3 processor with no level 2 cache, a 66 MHz system bus, 16 MB of RAM, a 2 GB hard drive, a 12.1" 800 x 600 passive matrix screen, and 2 MB of video RAM. There was no S-video port, and the modem was an optional extra on the base model. You could optionally order it with a 13.3" or 14.1" 1024 x 768 screen. The floppy drive was also optional. 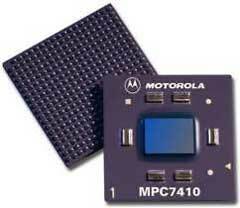 250 MHz or 292 MHz G3 processors with 1 MB of L2 cache and an 83 MHz system bus. The 250 MHz machine came with 32 MB RAM, while the 292 MHz unit shipped with 64 MB of RAM. 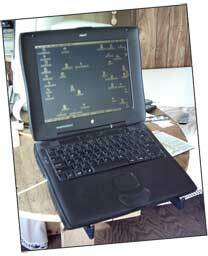 WallStreets had either a 13.3" or 14.1" 1024 x 768 screen with 4 MB of VRAM, a standard S-video out port, and 56 K modem. Either 4 GB or 8 GB hard drives were available, and high-end models came with a floppy drive expansion bay module as well. Both the MainStreet and WallStreet came with 20x CD-ROM expansion bay modules, and a DVD-ROM drive kit was offered (but rarely supplied) for the 292 MHz WallStreet. The PowerBook G3 "PDQ", which is our birthday subject, came along in September 1998 as a sort of second-generation WallStreet. The WallStreet name is now generally applied to all G3 Series PowerBooks from May 1998 through May 1999. The origin of the "PDQ" code name is rumored to be Steve Jobs' decree that problems besetting the early PowerBooks G3 Series get fixed "PDQ" (pretty damn quick). Another reason for the mid-life revamp was that PowerBook production was shifted from Apple's own facility in Cork, Ireland, to a subcontractor, Quanta, in Taipei, Taiwan - the company that still builds and helps engineer PowerBooks and iMacs. All PDQ units have a 66 MHz system bus, a full slate of ports including S-video out, standard 56 K modems, and a 20x CD-ROM drive. The 233 MHz and 266 MHz machines came with 32 MB of RAM, while the 300 MHz machine shipped with 64 MB. The floppy drive was phased out as a standard feature. The troublesome 13.3" screen was also dropped, and the 14.1" 1024 x 768 monitor and 4 MB of VRAM was standardized across the line. However, about a month after PDQ debuted, Apple released a low-end replacement for the MainStreet, which has come to be known as the "WallStreet LE". This machine had most of the good stuff shared with its more expensive siblings, but it was limited to availability with the 233 MHz/512 KB cache processor and a 12.1" 800 x 600 active matrix TFT screen with 2 MB of VRAM. I bought one of these units in January 1999, and it's still in use as my wife's email and word processing Mac, running Mac OS 9.2.2 (which is the maximum performance OS with the G3 processors). The original lithium ion battery, now eight years old, still provides decent runtime, which is just amazing. While the 266 MHz and 300 MHz PDQs are nominally a bit faster than their 250 MHz and 292 MHz WallStreet counterparts, there isn't much real world difference, as the slower system bus on the PDQs cancels out most of the speed advantage. The 12" 233 MHz PDQ/L E is almost equivalent in performance to the original 12" 250 MHz G3 Kanga, thanks to its 66 MHz bus versus the Kanga's 50 MHz bus. 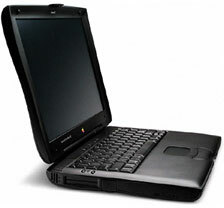 The WallStreet/PDQ was arguably the most comprehensively complete and expandable PowerBook ever built, with its full set of classic PowerBook ports; two PC card slots allowing upgrades such as USB, FireWire, WiFi, or other things; ethernet and IR connectivity; its expansion day; the ability to support batteries in both the left and right bays; and the availability of third-party processor upgrades up to 458 MHz, 466 MHz, and even 500 MHz (the latter of which outperforms a 500 MHz Pismo in some benchmark tests). The WallStreet/PDQ keyboard is also one of the the best ever offered on a PowerBook (the best IMHO). These are still lively machines, especially with a processor upgrade installed. However, they won't support Quartz Extreme in OS X, and they're not officially supported for OS X 10.3 "Panther" and 10.4 "Tiger". You could even add a DVD and/or CD-RW drive to the WallStreet's expansion bay with MCE's Xcaret units - unfortunately out of production now (a few high-end WallStreets shipped with Apple's somewhat problematical first-generation PowerBook DVD kit). Things to watch out for when shopping for a used WallStreet/PDQ are problems with the screen lid hinge "clutches" - a potentially expensive repair job - and flaky video with the Series I units equipped with the 13.3" screen. There were good reasons why this screen option was dropped with the Series II introduction in August 1998. Another fairly common fault with the WallStreet was bad power manager boards, but these should have been dealt with long since on machines still in use. Series I only get a Rage II video card, which is slightly inferior to the later Rage Pro. Both have 4 MB VRAM on board except for the 12.1" screen units, which have a paltry (but adequate) 2 MB. Note also that these units are only officially supported by OS X up to 10.2.8, and because of their "Old World" ROM, OS X must be installed on a volume or partition smaller than 8 GB. Frankly, as much as I love the old WallStreet, you should also carefully consider a newer solution like a Lombard, Pismo, or dual USB iBook if you're looking for an inexpensive 'Book and you want to run OS X. The WallStreet/PDQ G3 Series is one of the all-time great PowerBooks, but the newest units are now just shy of eight years old; they are not officially supported by OS X 10.3 and later (although Ryan Rempel's XPostFacto hack can install Panther or Tiger on a WallStreet), and they don't support USB or FireWire natively. I have both USB and FireWire PC card adapters for mine, but it's not quite the same thing. And the WallStreet only supports 512 MB of RAM, which I consider marginal for decent OS X support. The WallStreet flies running Mac OS 9.2.2 - even on my 233 MHz unit with 512 KB of backside cache, the second-slowest WallStreet variant. The ultimate OS 9 revision is rock solid on a WallStreet (I've gone more than three months at a time in daily service without rebooting), and I find that the 192 MB of RAM I have installed is more than ample with OS 9.x. However, if you have a 292 MHz or 300 MHz WallStreet, or if you've installed a 400 MHz or 500 MHz processor upgrade, you may find performance with OS X satisfactory, if not scintillating, especially if you max the RAM out to 512 MB. The WallStreet is a relative pleasure to open up and work on compared with the recent PowerBooks and iBooks. Adding RAM, installing a larger capacity hard drive, and even replacing the processor card all amount to 10-20 minute operations with only a screwdriver needed. But does the eight-year-old WallStreet/PDQ make sense as a workaday computer today? Well, as they say, it depends. If your needs are modest, and you only want to do word processing, email, some Web surfing, and a bit of digital photo editing, a WallStreet could still serve you very well, especially if you're content running OS 9.2.2 and contemporary Classic software. If you have a WallStreet, and it's doing the job you need it to do without major slowdowns or software/task incompatibilities, hang on to it for a while yet. It's a great old computer. On the other hand, if you have a really nice WallStreet that you're fond of, perhaps with the RAM maxed out and a large capacity hard drive already installed, there are several processor upgrade paths open to you. XLR8, Sonnet, and Wegener Media offer processor upgrades for the WallStreet. Fully compatible with Mac OS X, the XLR8 466 MAChSpeed G4 WallStreet upgrade with its super fast 1 MB cache and proprietary MAChSpeed Control software transforms your PowerBook G3 WallStreet into a G4 AltiVec energized laptop. Great for graphics, video, and games . . . and will speed up Mac OS X performance on the old WS. Mac OS X and all native graphics applications are now optimized for the G4's velocity engine. Even Mac OS X's Finder is more lively with a G4 under the hood. The system is fully compatible and runs faster than a 400 MHz PowerBook G4. Factory installation and testing ensures that you'll be running at full G4 speeds with no upsets - just power-up and go. This is an exclusive Daystar product and backed by Daystar's unique 90/728 Warranty program. G4 power for the WallStreet. The Presto combines current build technology - the ultra-cool G4/7410 processor with fast 250 MHz L2 cache. The result is a very powerful processor, running very cool (average temps are less than 45° Celsius - about 112°F!) Our ultra-fast backside L2 cache (1 MB running at 250 MHz!) ensures an excellent performance boost, with performance increases in excess of 10x the speed of your original WallStreet card. Turn that lazy WallStreet into a rocket with the Allegro 500. Why not G4? Good question. The only real advantage of G4 is the AltiVec processor, which is rarely utilized except for video processing. And the WallStreet is really not set up for video processing anyway, so if you were going to do video, you'd save that extra $150 and get a Pismo. Allegro have been able to reduce processor heat even in comparison to the G3 PowerBook Pismo. Our processor operates at a balmy 55°C (that's 131°F), which means great reliability for your processor and excellent performance for you. Now, one unit fits all WallStreet models! WallStreet 1 or WallStreet 2. Kit includes processor, tools, installation photo-guide, and upgraded heat dissipation panel. Tools & core components may be returned for rebate. Purchase requires return of your original WallStreet card. A $30 core charge will be refunded upon receipt of your old card. Core boards must have cache installed to qualify for core rebate. Units are warranted for 1 year from date of purchase. The Sonnet Crescendo/WS G3 incorporates a 500 MHz PowerPC G3 processor with 1 MB Level 2 backside cache for a performance boost of up to 2x over the original system, and it can take full advantage of the latest OS X and Classic applications. The Crescendo/WS is compatible with your existing hardware, software, RAM and peripherals. The Crescendo/WS integrates with your system software, supporting Mac OS 8.1 (G4 requires Mac OS 8.6) through OS X 10.2.8. The Crescendo/WS processor upgrade card integrates with your existing hardware and software. Run the latest system and application software faster and more efficiently. The Crescendo/WS is easy to install with step-by-step, illustrated instructions. Launch the included Sonnet Installer application to take advantage of the original system software. Shut down and open the system, remove the original processor, move the RAM to the Crescendo/WS, then simply pop the Crescendo/WS into place. Restart the system and you're up and running.